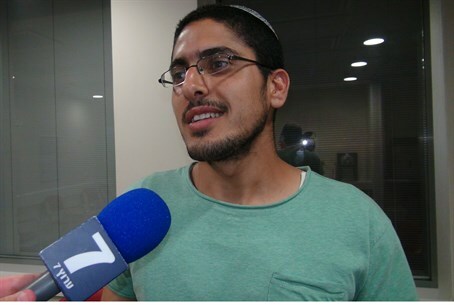 In an interview with Arutz Sheva, Uri Azrak recalled the moment at which a terrorist's firebomb struck his car Monday night. His wife, Inbar, 27, suffered burns on her legs and arms, and a soldier who arrived on the scene suffered smoke inhalation and some burns. “My wife and I were having a simple conversation at the traffic light when we were hit by a firebomb from the right side,” Azrak recalled. “I was driving, my wife was next to me. The firebomb smashed the glass and the fire spilled onto my wife's legs, it caught her skirt and legs. In a few seconds' time I was outside the car. “My wife took a few more seconds to free herself of the seat belt as she was burning. She started rolling on the floor and I helped her put out the flames. She was very brave, she did not scream or anything. I felt threatened and I drew my handgun and cocked it. I looked around for the person who threw the firebomb and saw no one. After a few minutes, a very nice couple stopped their car and helped me place my wife on the sidewalk. A few more minutes passed until the rescue and security forces arrived.